There is an unprecedented amount of passion surrounding the presidential election this year. Spend five minutes on Facebook for confirmation. There’s an endless stream of politically-oriented postings, and vitriolic dialog erupting regularly. Some posts are funny, while others are hateful. A certain percentage are factually correct, while the remaining are inaccurate. Healthcare, environmental issues, national security, marriage equality, education, women’s issues, unemployment, and the economy are some of the big issues of the election. People want change in so many areas this year. Don’t wait four more years, seeing the process of voting as your contribution to change. Do something. Take your passion off the internet next Wednesday, and make a difference in the world. Next post: Pause. Breathe. Start Anew. Great message, Kelly. Here’s hoping it’s something people can embrace and live out. When O won the last election, Change was a big part of his message then as well. Unfortunately too many people fail too often to realize that change can take time, and they labeled his efforts as failed. Change also takes action, as you’ve so gracefully said here today. Looking forward to changing it up, regardless of the election results. I am too, Sean. The energy put into battling over politics on Facebook could be channeled in a more positive way these next four years. Did you mean Tuesday, Nov. 6, election day? Ah, I see the confusion. My thought is Wednesday, the day after the election, people should start looking for ways to make a change. Nothing left to do regarding the election at that point. Beautifully stated, Kelly! I can’t wait until this election is over so I can enjoy FB again and speak to my parents (Romney-lovers) without tension. This is such a heated election. I completely understand. Last week I had to walk away from a conversation for fear what I would say. I am glad you like the post, Brook! I feel like you are the change with what you do each day at BNV. You are trying to make something happen on a larger scale. I managed to drag myself into the early voting. There are so many ways we can be the change, we shouldn’t stop with just voting! I haven’t heard that phrase in a while. Thanks for the reminder. Jenni Chiu @ MommyNaniBooboo recently posted..Two Inner Monologues At A Sunday Brunch. 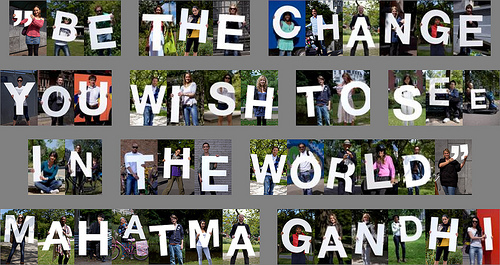 Yesterday I wrote “Be the Change” and the post for Saturday! It’s going well so far. I am off to read your last two posts now. I read your piece. It was a great post on perspective. It can be applied to any part of our lives.